The countdown to Christmas has begun, and that means shopping, decorating, wrapping, and, of course, cooking. While whipping up a festive feast can bring many joyous moments, it can also bring with it hours of planning and stress, particularly when it comes to preparing and cooking the turkey. 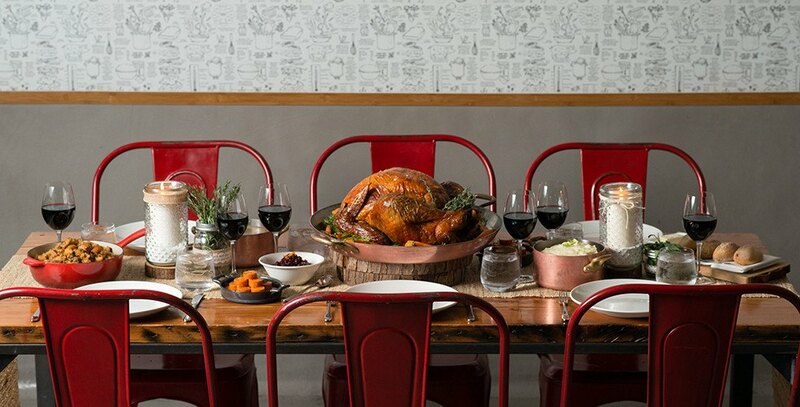 To shed some light on roasting a great bird, we asked Vancouver’s Railtown Café’s chefs and co-owners Dan Olson and Tyler Day to jot down their top, fail-proof tips for cooking a succulent, perfectly browned turkey, for the ultimate festive feast. 1. When choosing your turkey, estimate approximately 1lb per person, or slightly less for larger turkeys as there is a lower bone-to-meat ratio. 2. 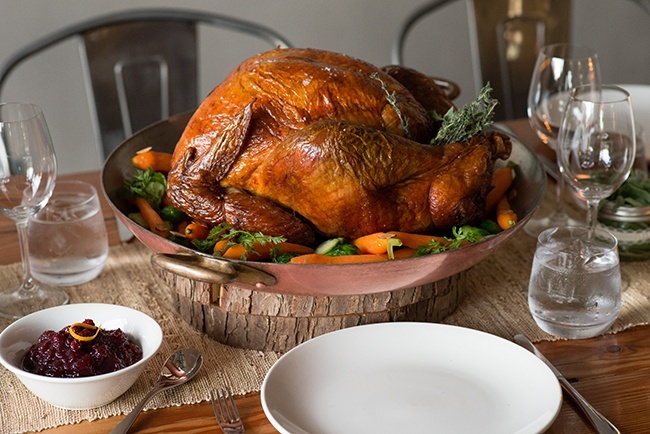 If you have the time, brine your turkey in advance. It’s a little extra work (and fridge space), but your bird will be perfectly seasoned and moist, and will come out of the oven with a nice golden, caramelized finish. 3. For more even cooking and a juicy bird, we like to say, “keep it low and slow.” Start off at a higher temperature — around 375°F until golden brown — and then drop it down to 200°F until the internal temperature reaches 155°F. 4. Create a tight seal. Stuff the cavity of your bird with aromatics such as garlic, sage, bay leaf and thyme, and truss it into one solid unit to ensure even cooking. 5. Cook your stuffing separately and not in the cavity of the bird. It’s safer, as there’s a lower risk of contamination if the stuffing doesn’t reach a high enough temperature. Plus, an unstuffed bird cooks faster and more evenly, and you can make a much larger quantity — and hey, who doesn’t love stuffing? 6. Reserve all of those tasty juices! The drippings are my favourite part of cooking a turkey and have so much flavour. They’re your not-so-secret ingredient to the best gravy ever. 7. Rotate your bird. Start with the legs in the back of the oven where it’s the hottest, then finish with the bird in the opposite direction to promote even browning. This is especially important if you’re using an oven that doesn’t have proper circulation. 8. Rest your bird head down and legs up, and wait at least 30 minutes before carving. Keeping the legs up allows the juices to flow downward through the white meat, which needs the most help to stay moist. 9. Do as much prep in advance. Plan your menu so that most, if not all, of your starters, sides and dessert can be made ahead of time, so all you need to worry about is the turkey, stuffing and gravy. Pumpkin soup, cranberry sauce and cheesecake are but a few holiday staples that are just as good, if not better, with some extra time in the fridge. 10. If all else fails, call an expert! 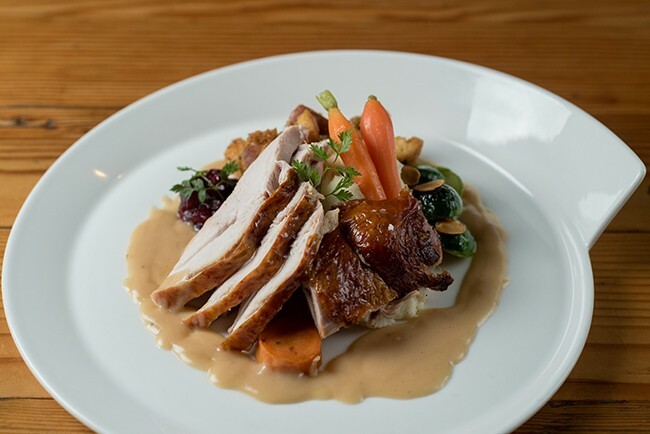 If cooking a turkey seems too daunting or if you’d rather just spend more quality time with loved ones, there are many ready-made turkey services available, such as the one we offer at Railtown.